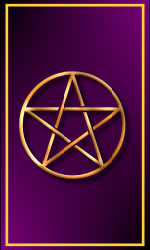 This is a one card reading which endeavours to offer an insight into your current situation or perhaps guidance to a question you may have. The reading will consist of a single card appearing with the appropriate interpretation described below the card. How the cards are interpreted depends enitrely on the reader. There are many interpretations and the enqirer should endeavour to interpret the card in several ways. You may enquire as many times as you feel necessary.